We at AllThingsD are often bombarded with email pitches for new and innovative or “disruptive” technologies. But when we get one that says technology is for the birds, we can’t help but take a second look. 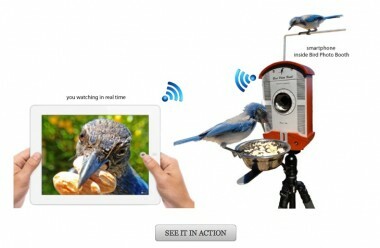 This particular pitch crows about Bird Photo Booth, a Kickstarter-funded contraption that lets bird-watchers remotely view, photograph, video and even talk — yes, talk, via FaceTime — to backyard birds. Users can then share their findings to social networks (which one must assume includes tweeting). It works with iPhone, iPod Touch and GoPro cameras, and has a suggested price of $149. 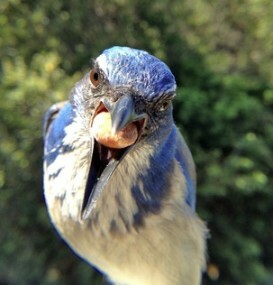 This initially brought to mind images of blue jays wearing GoPro cameras, or parrots squawking “Siri want a cracker?” into iPhones. But the device is actually a kind of bird feeder that houses your iPhone or GoPro, so you’re getting, uh, a bird’s-eye view of the birds at the feeder. Okay, here comes the cold water: Since it’s a Kickstarter project, this bird feeder isn’t shipping yet. When you “buy” one, you’re simply contributing to future production of the product — assuming creator Bryson Lovett hits his fundraising goal of $35,000 in the next 27 days. And while the Bird Photo Booth is said to be weatherproof, it’s not waterproof — so you probably wouldn’t want to forget about your iPhone and leave it outside in extreme weather conditions.